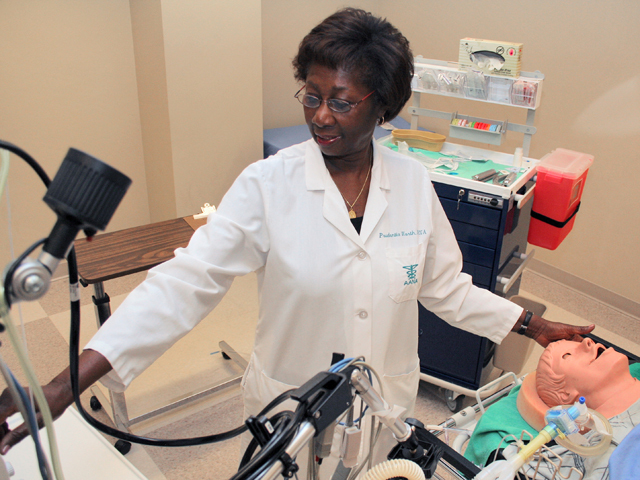 When Prudentia Worth enrolled in Wayne State’s anesthesia program as a private duty nurse, she never imagined that she’d be running the place four decades later. Worth had an everyday encounter that ended up being a life-changing moment. As a private duty nurse, Worth wasn’t comfortable with how little was being asked of her in what some would call a cushy job. “I wasn’t used to not working when I came to work,” she recalled. One day, a cantankerous patient brushed aside all of Worth’s attempts to care for her — not even allowing her to tilt the window blinds — and banished her to the hallway. As Worth sat outside her door awaiting further orders, a surgeon passed by and struck up a conversation. He suggested a career move and directed her to a man named John Garde, who had recently co-founded a Wayne State program training nurses in anesthesia management. “Nurse anesthesia was not practiced in England, so I didn’t even fully understand what I was getting into,” Worth said. A month later, however, she was fully enrolled. The experience taught her that not all students proceed at the same pace and informed an approach to teaching that would guide her through the next 40 years. Allied Health Professions in 1980. She rose through the ranks to director of anesthesia services at Detroit Receiving Hospital — holding that position until 2008 — and succeeded Garde as director of Wayne State’s nurse anesthesia program in 1988. She has served on more than a dozen professional committees, publishing as many articles and earning an equal number of awards and honors along the way. She has become an EACPHS cornerstone, deemed by colleagues and students alike to be paramount to the program’s success. She also has obtained grants to keep her classroom on the edge of technology, which, among other things, has allowed for expert guest speakers from across the country.